You’ve found an interesting vintage Omega watch. Perhaps on eBay or another auction site or even at a yard sale. It looks great. The price is right. But how do you know if it’s genuine and not some knockoff? In other words: how do you spot a fake Omega? There’s a lot of info about “detecting fakes,” but it’s not all good so be careful. Many websites are good at ranking high on Google and getting social shares, but they’re neither experienced watch collectors nor high-end dealers. So, don’t put too much trust in those fancy infographics. This article is about vintage Omega watches in general and the steps to take to authenticate them. I’ve added some final tips at the conclusion. First, look closely at the dial and hands. Omega is a respectable brand, and they had standards to live up to. The lacquer, the font, the text/printing, minute track, etc. should all be of consistently high quality. The alignment should be perfect, and there should be no misspellings of any kind. That includes the case and the case back as well. The lume on the dial and in the hands (if any) should match. It’s possible that exposure to light and humidity slightly changed the color of the hands. Also, keep in mind that lume will discolor over time. A watch that’s 40, 50 years old or even older will show some minor signs of age at least, and that’s fine. It’s suspicious if the lume in the hands or on the dial is still incredibly bright. It doesn’t immediately mean there’s something wrong, but you should at least investigate further. Even if they did re-lume the dial or hands, it doesn’t make it a fake piece. It does mean, however, that it’s not 100% original anymore. You can read more about redials and how to detect them here. The hands should be the correct type of hands that Omega would have used. Below is a chart of Omega hands from 1954. More on the correct type of hands later. Omega uses these numbers to distinguish between models and types. Omega stamped these numbers on the inside of the case back. You can use it to research the watch in question to compare the dial and the hands with the one you’re looking at. Several books use these codes to list watches, but the most common resource is the Omega Vintage Database. Not all entries have pictures, but the database has lots of images to compare dials and hands. It also states what movements have been used and what the production timeframe was. Be aware that the database isn’t always 100% accurate and it doesn’t include all reference numbers. However, it’s an excellent resource and should be the starting point of a search for a particular vintage Omega watch. The Vintage Omega Database sometimes uses an extra 0 after the decimal point. For example, the Vintage Omega Database lists the 136.041 as 136.0041. If possible, try to determine what movement the watch has. Specific models only used certain movements and movements were only used for a certain amount of time. The Vintage Omega Database lists the movement or movements used for a particular reference number as well. When the caliber matches the one that the database has registered, you can check another item off your list. 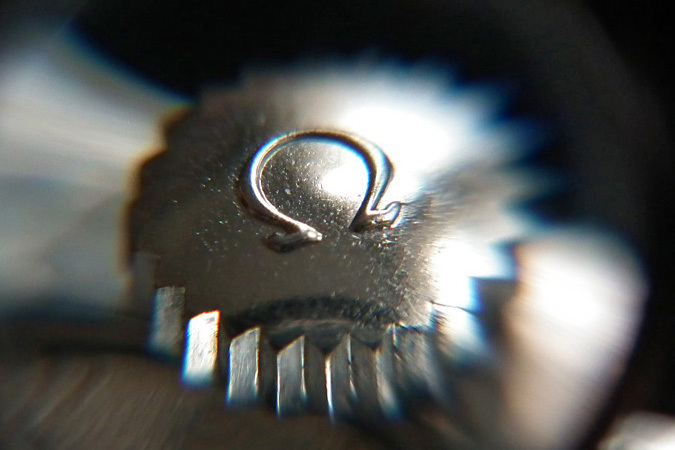 All Omega movements have a serial number. On most movements, you can see it on the barrel bridge or train wheel bridge. The serial number can be used to determine (with an accuracy of 1-2 years) when a movement has been manufactured. This should match the period in which Omega produced a particular model. It’s entirely possible that there’s a small gap in years between the movement and the watch. Sometimes the movement had been in stock somewhere for a while before being fitted into a watch. However, that shouldn’t be more than 1 or 2 years. Some handy charts that you can use to date your movement are by Omega-Fanatic and Chronomaddox. Omega started to sign all the crowns and crystals around 1950. Some say it’s from 1945 onward and others say it’s sometime between 1947 and 1950. There are a few Milspec Omegas that were produced after 1950 but still didn’t have a signed crystal and crown. In short, if you have a civilian vintage Omega timepiece that was produced after 1950, the crown and crystal should be signed. However, the presence of a signed crown or crystal is no definite proof in spotting a fake Omega. There are dozens of different types of original Omega case parts. Theoretically, someone could fit a signed Omega crown to a watch that’s supposed to have a different one. It’s an original crown, but the watch is not identical to how Omega produced it. Perhaps the stem or the crown (or both) had to be replaced, and they couldn’t be bothered to use the correct parts. The watch might be entirely original, but it has a generic crown or an original crown of the wrong type. That would be a little more difficult with a crystal because a crystal needs to be the exact size to fit correctly. In other words, you should examine the crown and crystal, but it’s not compelling proof one way or another. If it does match with the other info you’ve collected so far, it’s another check mark on the list. If you checked all the items above and you’re still not sure, you could always ask for help on one of the forums. Members are usually very knowledgeable about how to spot a fake Omega and are willing to help. Remember that prices way below market value are suspicious. There are still people who have no clue what they have, but in the age of smartphones and Google, they’re getting rarer every day. If it sounds too good to be true, it probably is. Whenever you’re looking to buy on the internet, you need to buy the seller first and then the timepiece. If the description, pictures or his/her reputation raises your eyebrows, skip that one. Sometimes it just doesn’t feel right, and it’s a good idea to trust your gut in these moments. There will be plenty more along the way. Don’t let all these “rules” and warnings discourage you. Vintage watches are awesome, and Omega is a fascinating brand with many exciting models. Unfortunately, that means that Omega is one of the most faked and frankenized watch brands, so be careful and use common sense. Do you have some tips on how to spot a fake Omega? Let me know in the comments below. The movement with the serial number and the case number say a lot but the Dynamic is a monobloc watch so it’s a bit more complicated to open it. You can always study the case, the dial, the hands, and the crown. If you want, you could send some pictures to info@wahawatches.com and we’ll be happy to take a look at it. I have a omega seamaster an do not know if real. Is it wise to purchase a vintage wrist watch online? I found a vintage a 60’s Omega Seamaster, but I fear with my (extremely limited) knowledge it is not real. It’s wise to ask questions before you decide to buy something and not afterward like I see so many do 😉 The watch looks perfectly fine from the pictures. Posting on several site….On the Omega site, it states that ladies’ metal band watches come in 18K yellow or white gold or in platinum. On Ebay there is currently a good selection of supposedly genuine Omega Deville watches in 10K gold filled. Are these automatically fake? I noticed that solid gold watches from that period are designated Omega Deville Prestige. Did Omega actually make a “popular” line during this period and add “Prestige” to designate the high end line? The prices are attractive, but I would rather buy a genuine, say, Movado than a fake Omega for the money! Thanks. In the past, there have been 10K gold filled bracelets so they’re not automatically fake. The Prestige is a 90s entry-level watch with steel, two-tone and solid gold bracelets. The Deville model itself dates back to 1967. Not all Omegas have the logo on the dial, sometimes just the name. Those ornate stone set crowns are called “cabochon crowns”. Perfectly fine for a ladies watch and the occasional smaller men’s watch as well. So, they sound like they could be genuine. Good luck with the hunt! Hi there can I email you some photos of an Omega watch I’m thinking of buying. Not sure if it’s real or not …. Could I send you some pics of a vintage Seamaster I am thinking of buying? Like Chris, am not sure if it’s a fake or not. Yes, sure. You can use the same email address. Hello guys, I read some of the posts and I hope you can answer my email but I did just send you some photos of a watch I just purchased and really hope you have time to look at it! Thank you very much! Hello. I suppose that this “Omega” is fake, am I right? You’re exactly right. The movement is very low quality and isn’t anything close to an Omega. The hallmarks are sloppy so it isn’t gold either. I also have acquired an Omega watch. I will send pics. Thank you so much. Hi Melvin, I have always wanted a vintage watch (wind up etc) and just came across a 1936 Omega “Birks Ellis.” I’m waiting for it to arrive any day by mail. My plan is to take it to someone I trust who owns a jewelry store. After asking the seller questions I was told it came from a collector. I hope it was a good buy for my 1st Omega (i did research as well). Hi Mark, I hope so too. Those dual name Omegas are great. Feel free to send some pictures of the watch to info@wahawatches.com when it has arrived. I will send you pictures of the watch that is still to be sold to me. If you can email a clear picture of the inside of the case back and one of the movement to info@wahawatches.com, we’d be happy to help.